Joe Teke, like many safety heroes, began his career on the frontlines as a volunteer firefighter in Indiana. Shortly after, he took charge of 911 operations for Ohio County in Indiana. Those experiences fueled his passion for helping others to stay safe. After his career as a firefighter, Teke became a certified ergonomics technician hoping to improve the safety challenges of the modern workplace. 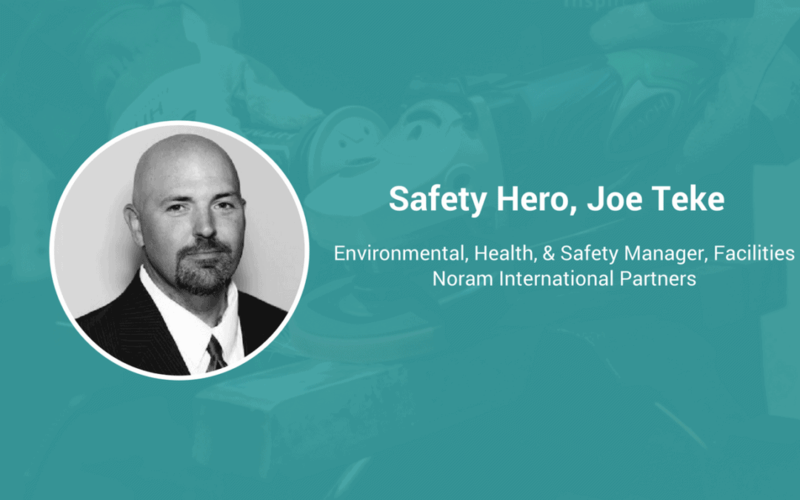 Currently, Teke serves as the Environmental Health and Safety Manager of Facilities for Noram International Partners where his attention to safety detail has resulted in 680+ days without a restricted or missed day recordable injury. My eyes were opened to the importance of safety during my career as a firefighter and 911 director. You see and hear about so many things that could have been avoided given the proper training safeguards. I wanted to keep people safe and I found that a career in safety was the best way to do that second to my work in the department. Communication and a passion for what you’re doing are absolutely essential for a safety professional’s success. You have to be able to talk to anyone about anything, and you have to make sure that they understand the best way to do things regardless of their role. You have to be passionate because the job is tough, and requires complete dedication to what you’re doing. Being an EMT and fireman, you see a ton of stuff that shows you the importance of workplace safety. Even with minor incidents, we would always review what we did, what could be improved, and how we could do better the next time. That’s how I approach my role as a safety leader too. That we are a resource for everybody. We are a resource to help every employee perform better while ensuring that they go home to their families each night. We are there to examine how things can be improved, and to help people follow the best protocols and procedures possible. I was a high school basketball coach for 5 years and I take that to my job. My training sessions are pre-game speeches. Our shifts on the floor are our games. And, safety committee meetings are our film studies where we review what we do well, what we can improve, and how we can best prepare for the future. The understanding of senior management’s role in safety. Safety starts at the top. An organization’s leadership MUST believe safety is critical for success or the employees won’t feel that way either. Once that starts a safety-based culture can flourish.